PQI has launched an expandable Wi-Fi SD card that can be configured for up to 32GB of storage and Class 10 support. The Air Card will allow users to wirelessly upload photos without having to ever touch a sync cable or remove the card from its device to use in a card reader. 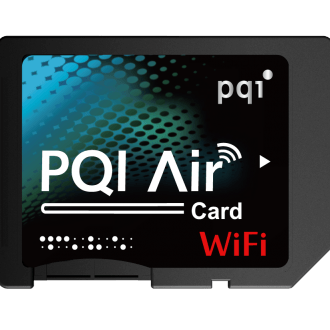 The secret behind PQI’s Air Card is that the 801.11b/g/n Wi-Fi internals are housed in the SD card while storage is handled by a separate microSD card that’s inserted into the side of unit. The Wi-Fi is activated when the user turns on their camera and there are Android and iOS apps that will facilitate up to three simultaneous file sharing sessions. The idea of a Wi-Fi SD card isn’t new as Eye-Fi has been marketing a similar device for a number of years. I first learned about Eye-Fi’s wireless SD card at CES 2010 and thought it was a fantastic idea for photographers, especially those working in a studio where it would be convenient to immediately upload images to a computer for review. I elected to wait it out as the best card they offered, an 8GB Class 6 device, was pretty expensive and I wanted something faster with more storage. It’s now well over two years later and the 8GB Pro X2 is still listed as “new” on their website. I can’t help but feel that they missed out on a great opportunity to sell a lot of Wi-Fi SD cards. VR Zone recently spent some time with the PQI card and concluded that while they were able to upload images to their iPad relatively quickly, the user interface of the app was rather clunky and unintuitive. They give the nod to Eye-Fi with regards to ease of use, however if you need a faster card with more storage, this could be a viable option. PQI says the card will be available immediately but as of writing we were unable to find the card in stock anywhere. As such, pricing remains unknown at this point.